Cut 1 large purple eggplant into 1/2 inch rounds. Brush the eggplant with olive oil on both sides and place them on a tray with space between each slice. Pre-heat your grill to high heat. In the meantime, peel, seed, and chop 5 plum tomatoes and place them in a bowl. Add garlic, balsamic vinegar, olive oil. Place the eggplant on the grill and cook for 3 minutes to sear. 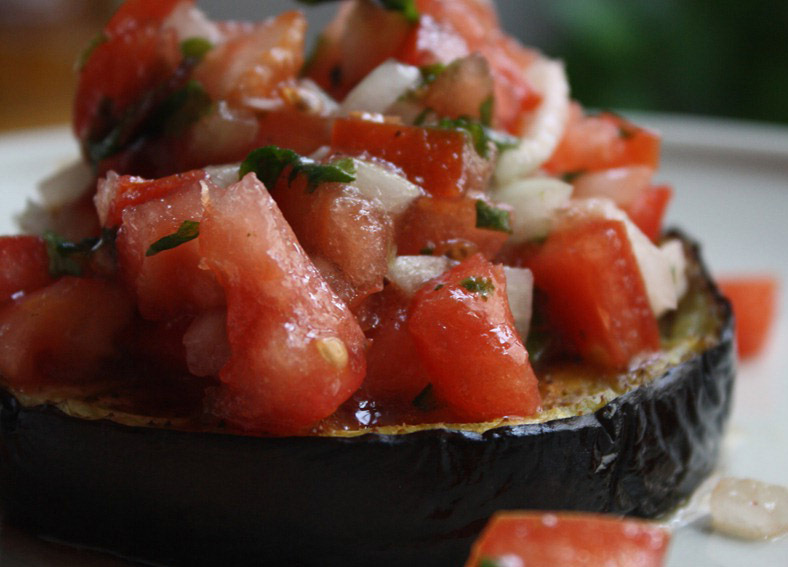 Flip the eggplant and spoon 1 tablespoon of the tomato mixture into each eggplant, close the lid and cook for an additional 3-5 minutes. Just before serving, sprinkle the fresh basil over the eggplants. This entry was posted in Metabolic Medical Center Recipes, Modified Profast (Fast and Flexible) Recipes, Party & Entertaining, Vegetables and tagged appetizer, basil, eggplant, tomatoes by foodies4mmc. Bookmark the permalink.